← Making It to the Makeover: A Month (of) Down (Time)! Milo figuring it out over a baby jump. Photo courtesy of Lindsay Gilbert. Heels down … up in two point … hands pressed into a crest release, knuckles white around the reins. Eyes up … remember to breath … trot, trot, trot … and pop over the fence. We all remember the first time we ever jumped. The saintly school horse that made us fall in love with the feeling of flying. The over-before-it-started adrenaline rush of the 6″ cross-rail that made us smile bigger than ever and beg our trainer to let us do it again. There’s an art-like science to teaching the basics of jumping to a new rider. Building their confidence, keeping them excited for the sport, all while training their body and mind a very specific skill set. It’s no different when starting young horses over fences. 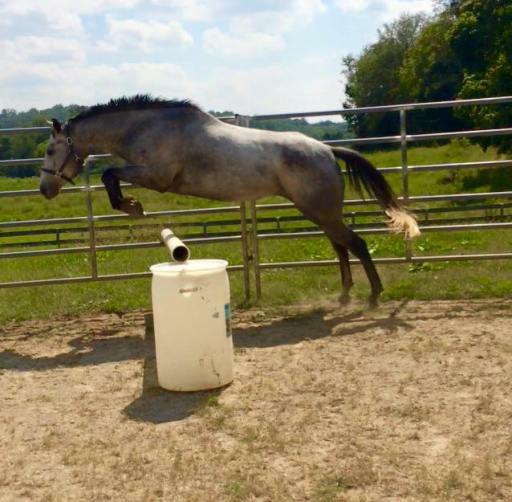 But, every horse slated for a jumping career has to start somewhere. With the first pop over a ground pole, the first steer towards a baby jump, with fingers crossed and a silent wish that the horse underneath you happens to put their feet in the correct place and keep their brain in their head. Figuring it out without worrying about a rider. Photo courtesy of Lindsay Gilbert. Like most things in life, we must start at the beginning. And if that’s not vague enough for you, here’s what I mean: Do not flip to the end of the book, do not pass go, do not collect $200 dollars. This is the boring stuff, but it must be done. I’m talking ground work, lunging over poles, lunging over cavalettis, making sure the basics are instilled on the flat and under saddle before you ever even mutter the word “jump.” It’s imperative for the sanity of your horse that they can understand, without a rider on their back, that they can make it safely from one side of an obstacle to another without the world ending. And in laying the foundation for a solid citizen over fences, you must make sure your horse is able to perform basic movements on the flat. A solid walk, trot and canter, an understanding of steering, stopping, half halts and maybe even some bending and correctly using/balancing their body (if you want to get fancy!) need to be deeply ingrained in your horse’s mind. You need to have control over your horse on the flat before you can even begin to ask for it over fences. Yes, I know dressage can be boring, but you’ll thank me later. The last thing we want to do is overwhelm and confuse our equine partners as they’re learning a new skill. You may have dreams of galloping down the to the water complex, dropping off the bank and soaring over the skinny brush, but for now let’s stick to single cross-rail fences. No crazy fillers, no weird distractions, just simple, easy, confidence-building fences. Keep in mind, crossrail fences are the ideal jump for babies as they encourage horses to stay straight and in the center of the fence. Single obstacles are best to start out because the horse only has to focus on one thing at a time. When they’re ready for a line or a course, keep the jumps spread out with a straightforward approach as they have time to focus on their fence, recover and then focus on the their second fence. Just as all things in life, and especially where horses are involved, things may not go as planned. There will be roadblocks — duck outs, refusals, and weird deer-leap jump attempts. But no matter what your horse throws your way, keep your eyes up, your heels down and your tone positive. The one thing I can’t stress enough is to keep trying and to keep an encouraging attitude. In order to build a calm and confident jumper, you need to overlook the missteps and the faults. A flat out refusal at a fence may feel frustrating and scary, but by reacting in a negative way, kicking and whipping your mount over the jump, they only learn to be fearful of the fence and not trusting of you as a trainer. So when mistakes happen and things go awry, adjust, give your horse a pat for the effort and keep trying. Channeling my inner “listener.” Photo courtesy of Lindsay Gilbert. 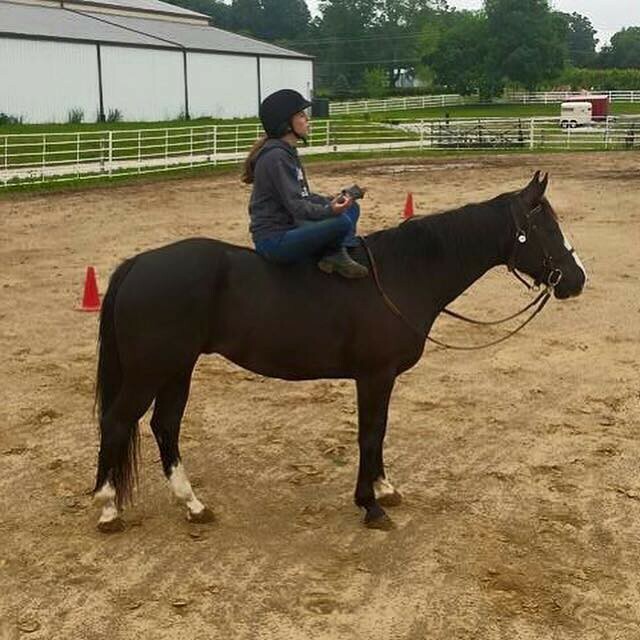 In learning a new skill, your horse will be looking to you for guidance and support. When they are confused or misunderstand the question, make sure you’re listening to what your horse is actually saying. 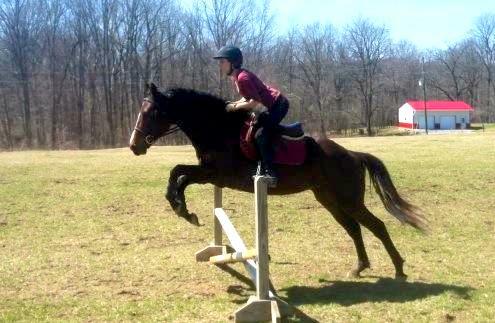 A runout doesn’t mean your horse is being “bad,” but rather that they don’t understand and you need more outside leg. A refusal doesn’t mean your horse wants you to jump the fence without them, but that they aren’t deriving confidence from you as their rider and that they aren’t in front of your leg. A rushing horse is probably one that is nervous or scared and just holding their breath and hoping they get to the other side of the fence in one piece. There are a million ways your horse can tell you what they’re feeling and what they need. Attempts at communication from the flick of an ear to the swish of the tail. When you are able to pick up on these subtle cues and acknowledge them, adjusting your training methods accordingly, your horse will thank you in the form of their best effort. And at the end of the day, you may not end up with a knock-your-socks-off upper level eventer. But, maybe you will. That first jump, and the dozens after them, will make or break your horse’s confidence, directly affecting their abilities in the future. So, there you have it. My insights into teaching your green bean how to jump. Oh, an one last thought … keep the wine handy!